The MDH stands for Month-Day-Hour. This is the Exact month, day , and hour that your Viper was manufactured. The MDH is located along the bottom edge of a decal which is mounted on the Vipers driver's side door, just below the latch mechanism. 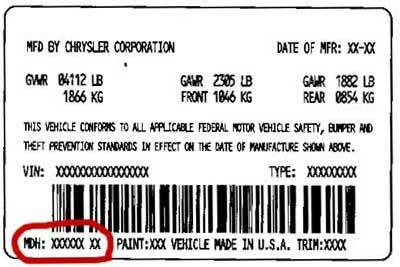 Vipers were NOT build in serial number sequence, the only way to know exactly when a Viper was produced is the MDH. The MDH format is MMDDHH where MM is the month, DD is the day, and HH is the hour.